We proudly present The Complete Gesu Bambino collection. 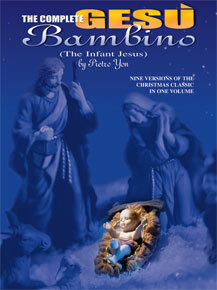 This beloved Christmas classic by Pietro Yon is presented here for high, medium, and low voice with piano accompaniment; piano solo in advanced, intermediate, and easy editions; an organ solo; an organ/piano duet; and for violin and piano. Also included in this collection is a biographical sketch of Yon. A must for every church musician!